Joseph Saxon Wainwright was born in St Helens in 1899 and before he went to war was living at 21, Brooke Street, St Helens. 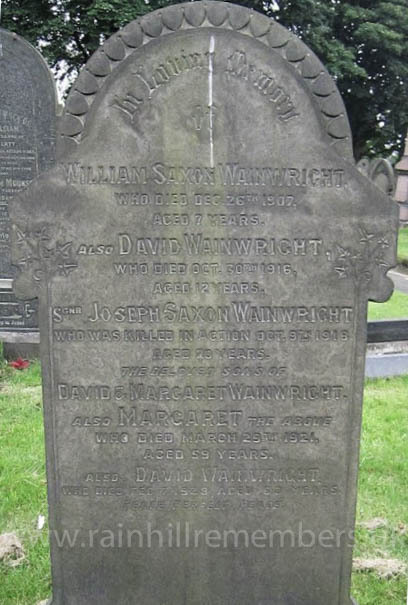 He was the third of four children born to David and Margaret Wainwright. David is listed as a labourer in 1911. The family later moved and their address was given as Whiston Waterworks, Cumber Lane and then the Stoops, Rainhill. Joseph enlisted after receiving notice, as Private 22302 in the South Lancashire Regiment 13th Brigade on 4th January 1916 aged 19. Before enlisting, he worked as a glass cutter. According to his records he was posted to France on 17th October 1917, spending 2 years 279 days in service before being killed in action on 9th October 1918, in France, a month before the end of the war. He had recently served in 1st/5th Battalion as a rifleman. In 1920, Joseph’s father received a plaque and scroll commemorating Joseph’s service and in 1922 his father received a further letter saying that bodies in all scattered graves and small cemeteries had been removed to other cemeteries. At a special ceremony at the Warrington Road Cenotaph on Sunday 3rd July 2016, Rainhill village dedicated a new plaque bearing the names of 17 men with Rainhill connections who perished during WW1. These men's histories were found during Rainhill Civic Society's research. Rainhill Parish Council funded the plaque and organised the ceremony with Rainhill Civic Society, our local Churches and the Royal British Legion. 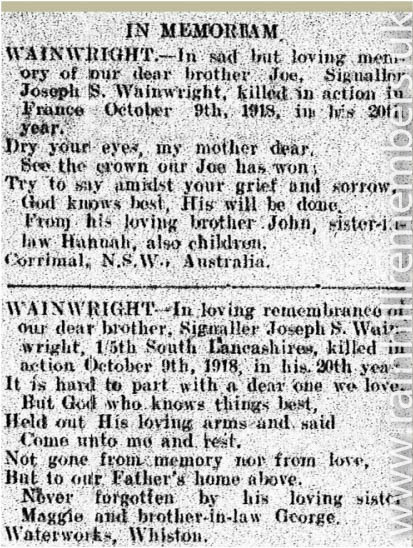 Joseph Saxon Wainwright is one of those names. Joseph is remembered on the Wainwright family grave stone in St. Ann's Churchyard.